The X-Type series was first introduced in 2001 as a compact executive car and after little under a decade, the series was retired in 2009. After that date, only used Jaguar X-Types were available. 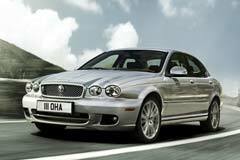 Jaguar’s X-Type was made available as a 4-door sedan or 5-door estate with several engine options including a 2.1 V6, a 2.5 V6 and a 3.0 V6 liter gas and 2.0 and 2.2 I4 engines. All options came with either a four-speed manual or five-speed automatic transmission. Customers had the choice, depending on the engine version, to go for front-wheel or all wheel drive. In terms of exterior design, all models from the series featured round head lights, small mesh grill and a prominent front bumper. The same type of bumper shape has been used for the rear. The interior focused on delivering a sense of luxury using all leather seats and elements with wood-like decorative elements. The central dashboard was placed symmetrically between the driver and front passenger seats. 2004 X-Type 4dr Sedan 3.0L 2004 Jaguar X-Type, Ebony with 97756 Miles available now! X-Type 2.5 2004 Jaguar X-TYPE, White Onyx with 116331 Miles available now!